Today is the day we celebrate the women who bore us, raised us, fed us and kept us as safe as possible until the age of adulthood. As a mother, I have to say I enjoy having a day when my babies are supposed to love and hug me, tell me how much they appreciate me and, in return, I get to snuggle with them more today than on any other day. I woke up at 6 a.m. and sat outside in the chilly morning air for nearly an hour before moving back inside and relaxing on the couch while waiting for my boys to get up. Typically, as y’all well know, Caiden gets up at the crack of dawn. Most mornings, when I am woken this way, it is instant grumpy to his overabundance of energy. By getting up so very early, I was ready for him and was able to snuggle close and smell his “sunshine and kisses” for a few minutes before doing anything else. When Brendan got up, it was the same and it was pleasant. I enjoyed it immensely and wish I could have for much longer. By this point, however, I was more than ready to visit the bathroom. I’d deliberately not done so because I was trying to make sure the boys didn’t wake up. The day officially started and I sent off a myriad of texts to mothers in my realm, wishing them a Happy Mother’s Day. After that, I got to thinking. What about the blogging mothers? The ones that give me (and countless others) inspiration? I decided that today was a great day to honor them and let them know that, even when they don’t hear my voice, they are an inspiration to me and I appreciate everything they say and show. Fly on the Wall : Everyone knows I love Fay. She’s one of my biggest supports here in the blogging world. She meets every challenge of life as a challenge that she will endure and overcome. Her way of looking at disagreements with husband and children are unsurpassed. She is creative and enjoys all the little things in life that most of us end up taking for granted. I read every word she writes, every day, and never have regretted following her blog. She is real. She doesn’t put up a front and she doesn’t sugar coat a thing. You really are a “Fly on the Wall” of her life when you read her words. The great part is, you also get to see the challenge met and overcome. Team Harmon : The beauty and grace that she meets each challenge only serves to remind me that it isn’t all that hard to find the good in everything and meet challenges the way God intended. I love reading about her children and think that her pictures are simply divine! I love how her children look so beautiful in every shot – even if coming off a Rugby field, covered in mud and bruises. The Laughing Housewife : A wonderful way of looking at life – with humor! Instead of dreary discussions about life as a wife and mother dragging her down, she answers everything with laughter. A great dose of fun is just what the doctor ordered! Texana’s Kitchen : Mostly recipes. However, nearly ever post is about her family, her boys, her life as a mother. I find inspiration in the way she presents her children when she talks about them. I enjoy the way she looks at life and, as I am in my 40s as well, understand a lot of her thought processes. My Men and Me : Another blog about a real mother – not a bunch of pomp and fuss. This is life, as God intended, and with God in charge. Inspiration can’t be found any better than this and I enjoy reading the words she gives to the blogging world. Getting a Christian view on things helps a lot and this blog does have quite a bit of that. I’m glad I found her! Loving Life : Another blog written by a Godly wife and mother. Inspirational words do come and are received by me. I enjoy reading the posts and getting another perspective on things that come my way in life as a mother. That’s pretty much it. I wanted to thank the ladies for their “Inspirational Blogs” and hope that they continue – they are definitely enjoyed by at least one person out here in the world of the internet. 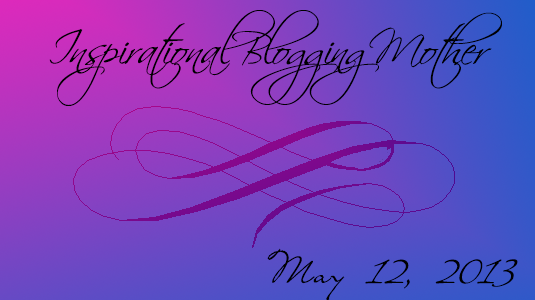 So – Thank you, Ladies, Wives and Mothers of the blogging world and a very special Happy Mother’s Day to you! *I’m not asking anyone to pass this around. I’m not telling you to give it to 5 or 10 friends. I just wanted to share. Do with it as you will. Love ya, friend. 🙂 Thank you for always being there for me. Hello. 🙂 Thank you for stopping by! I’m glad you got a chance to!